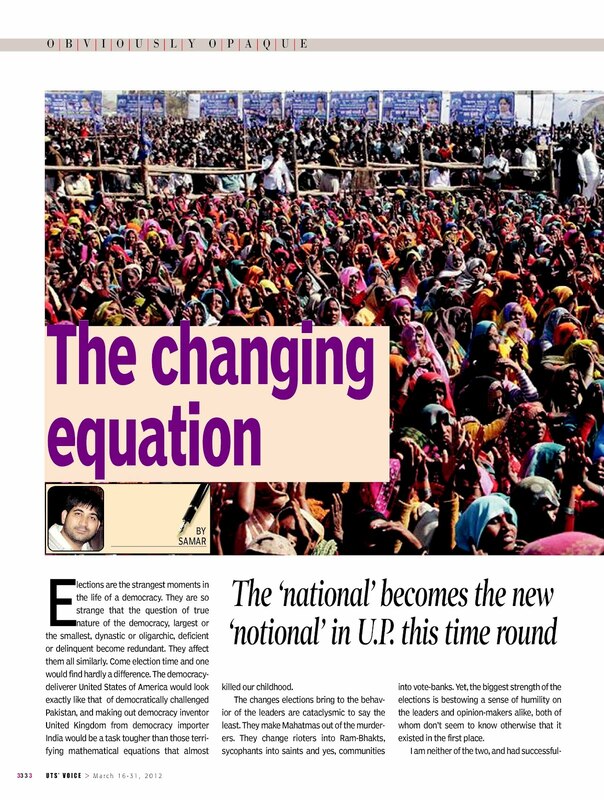 Message of the Mandate: The ‘national’ becomes the new ‘notional’ in U.P.! Elections are the strangest moments in the life of a democracy. They are so strange that the question of true nature of the democracy, largest or the smallest, dynastic or oligarchic, deficient or delinquent become redundant. They affect them all similarly. Come election time and one would find hardly a difference. The democracy-deliverer United States of America would look exactly like that of democratically challenged Pakistan, and making out democracy inventor United Kingdom from democracy importer India would be a task tougher than those terrifying mathematical equations that almost killed our childhood. The changes elections bring to the behavior of the leaders are cataclysmic to say the least. They make Mahatmas out of the murderers. They change rioters into Ram-Bhakts, sycophants into saints and yes, communities into vote-banks. Yet, the biggest strength of the elections is bestowing a sense of humility on the leaders and opinion-makers alike, both of whom don’t seem to know otherwise that it existed in the first place. I am neither of the two, and had successfully sensed the public mood till recently. I would laugh at the predictions made by those know-all jerks gleaming in the studios. I would make friendly bets and would look forward to the days of counting and declaration of results, for those drinks my friends would be paying for. I had hardly lost any of them till date. Just to give an example, I was richer by a couple of bottles by the end of the last assembly elections in Uttar Pradesh for the simple fact that no one apart from me and that fiery journalist Vidya Subramaniam from The Hindu was giving the Bahujan Samaj Party and its leader Mayawati a clear mandate. Even this time, she was the one closest to gauge the public mood and hint that it was going to be the Samajwadi Party all the way. Maybe, that has something to do with The Hindu style of functioning and their belief in basing news on facts and not sermons, which ironically is so ‘Un-Hindu’ a practice! Here comes the moment of revelation! I got it all wrong this time. That too by a huge distance, 1500 kilometers to be precise! Well, there is no point in challenging the exactness of the distance for it was ‘measured’ by none other than the victor himself, and who in his senses would want to challenge an outright victor. Way before the start of even the first phase of voting, Akhilesh Yadav, the Chief Minister designate of Uttar Pradesh, had asserted that he was 1500 kilometers and 51 constituencies ahead of the other Yuvraj, Rahul Gandhi. He was right. Samajwadi Kranti Rath of Akhilesh had traversed that much even before Rahul hitting the campaign trail. But then, UP elections were not about Congress or its crown-prince, was it? He was, of course, the darling of the media which remained in awe of him but who takes electronic media seriously anyway? Public memory is short, but not short enough to have already forgotten all the Barkha Datts and Vir Sanghvis, is it? Actually I am already wondering about the failure of these self-designated custodians of national conscience in giving a spin to Congress’s performance in Uttar Pradesh. Think of it, getting to 28 seats from 22 held in an assembly of 403 is inconsequential in terms of sheer numbers but then who had stopped the spin-doctors like Arnab Goswami to analyze it in Percentage-Point terms? He could have been screaming that the “truth of the matter” is that Congress has gained an increase of 27 per cent, a befitting proof for the success of Rahul Gandhi in winning the hearts and the minds of UP electorate”! he could have added, for a good measure, that at this rate Congress would return to power in UP by 2060! Maybe they restrained themselves for the game has always eluded the self-proclaimed game changer. There is a limit to one’s capacity of making heroes out of nobodies. They had done it before. In order to cleanse themselves of the Radia tapes, they invented a fake Gandhi aka Anna Hazare and fallen flat on their faces. They had also mastered the art of making villains out of heroes through ‘media trails’. Giving a hoot to the judicial process, they would dub a person ‘anti-national’ just because the police claim that. Throwing all the ideals of justice and fair trial into the dustbin, they would run ‘dramatized’ accounts of events like parliament attack and pronounce the accused as convicted even if the Court were to exonerate the person later. Good that a sense of wisdom prevailed on them this time round and they desisted from doing something similar. Or was it was the fear of that gentleman Markandey Katju, chairman of Press Council of India, who had taken the onerous task of bringing some ethics back? Or, was it the habit of the game changer of changing the not the game in hand, but the game itself as in moving from soccer to cricket in one leap of faith! Whatever it was for, it is welcome. Cut to that Sadhwi in saffron whose renunciation (and rejoining) of political parties seems to be far more real than her claims of having renounced the worldly charms. Mere idea of her would make all the Kabirs and Nanaks turn into their graves with repulsion. They lived and died for eradicating caste among other things and ensured that at least in the case of saffron wearing sadhus and here is one sadhwi, airdropped into UP’s political scene because of her caste! Her party that used to fashion itself as the army of Lord Rama himself has realised that in the badlands of UP religion gets trumped by caste and so it would have to dump Rama. Now, dumping anything for power was neither new nor hard for them as they had specialized in the art of picking the issue of the Ram temple and dropping it at will. They replaced their bets from Rama and put it on a Rajput, albeit a Lodh one owing to the numbers of their kin. End result, they came a cropper, losing even that seat of Ayodhya that has catapulted them to the national scene. But then, who said that UP elections were about BJP either? The electorate had decided to have a clean break from their past. They had decided to consign all the accusations of being illiterate savages of feudal badlands to the dustbins of history. They had decided to give evidence for nothing less than the theory of nationalism propounded by Benedict Anderson, the theory that says that nations are nothing more than imagined communities. And once the imagination is found to be based on shaky foundations, it gets dumped by the people. We are that part of the nation, UP electorate must have thought which the rest of the nation and its leadership can do without. It remembered, with horror, the statement made by Home Minister P. Chidambaram that India would have registered higher growth had North and East not impaired its quest for the same. They knew that not one of the accused of the 2G scam that cost the exchequer INR 176000 Crore and shivered at the audacity of the claim. They put the motor mouth in his place. This is how the polarization that took place in UP rendered the ‘national’ irrelevant. If it’s all about getting looted, we would better get looted by our own people seemed to be the thundering reply emanating out of the eerily silent electronic voting machines. Congress has forfeited its deposits in 240 constituencies while BJP was not trailing far behind at 230! The idea of the national was just a notional one. And this is where I had gone terribly wrong. I was giving BSP at least 170 seats even at the eve of the counting. Somewhere deep within my inner self, I knew that people have not forgotten the dangerous lawless days during the Samajwadi Party’s regime five years ago. I could see the unflinching support of the Dalits she enjoyed. I could see the indignation of her folks at seeing the Elephants getting covered while all the lotuses adorning the temples and cycles plying on the road. Yet, something was changing deep within, something I, and many others, had no clue of. It was a polarization of a very different kind. It was one against the assertion of the Dalits, their renewed and revitalized claim on dignity that has made the erstwhile rulers uneasy, very uneasy. 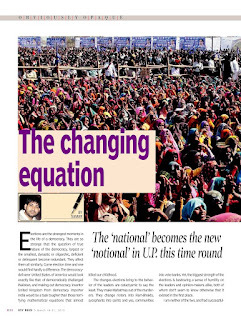 Behind the façade of ‘Sarvajan’ politics of the BSP laid the control in the hands of the Dalits and it was enough to send shivers down the spines of the higher up. For the uninitiated, the BSP’s control in the hands of Dalits was absolute not merely at the level of Maywati herself, it went down to the level of every single constituency where the MLA was answerable to the Sector in charge, invariably a Dalit giving rise to a flood of repulsion. All one needed was to tap this into a negative vote, which the Samajwadis so successfully managed. This is not to say that Mayawati or BSP were not at fault. They had not merely faltered but failed their own people. For their folks, the parks with statues were good, but hospitals and schools would have been far better. They could have afforded to ignore the national Rural Health Mission scam had something material reached down the line and initiated a process of converting the idea of dignity into a material claim. They could have ignored all the killings at the behest of ‘non-Bahujan’ MLAs of the party, had it not meant Dalits themselves being the victims in most of the cases. Mayawati had forgotten the most important lesson of the last assembly elections that it was as much her victory as was the defeat of Mulayam Singh Yadav led Samajwadi party. The ‘goondaraj’ of the regime had hinted than anything, just about anything would be better than that. She could have chosen not to return the favour. She woke up to all this, but way too late. By that time, the process of polarization was already reaching its crescendo. At one hand, the electorate had decided to punish the pretenders that came in the garbs of Congress and BJP and on the other, geared up for a fight for dominating the turf. And they did that by channeling all anti-BSP votes into the SP coffers. The end result was part satisfying, part harrowing. The results have shown that the days of upper-caste lordships are over. Now, it’s a struggle between the erstwhile deprived ones. The sad part is that this struggle is not a healthy competition but a dirty fight to finish turning victims into perpetrators and vice versa. Those who should have been natural allies are out on prowl for each other. Remember, the victory is not really such a landslide as it seems to be. The difference is just of 3 percentage points implying that the Dalits are standing firmly with BSP, and OBCs with SP. The point, now, is to build a bridge between them instead of barricading them into warring camps. That would be the spontaneous and natural alliance among the masses, and whoever starts that will be the master of history.